Q1: Which is the book that is read the most throughout the world? A: Qur'an-e-Kareem. It is Kalaamullaah i.e. the words of Allah. It is superior to all the worldly and divine books. Q2: What are its different names? A: Qur'an is also called as Qur'an-e-Hakeem, Qur'an-e-Majeed, Qur'an-e-Shareef, Kalaamullaah, Jawaame'ul Kalem etc. and it also denotes the holy text that is recited the most frequently and repeatedly. Q3: On whom was the Qur'an revealed? A: Allah Jalla shaanohu revealed Qur'an on Saiyed ul-Kaunain Mohammad his specially appointed rooh ul-ameen Jibra'eel (AS). Q4: Where was the first verse of the Qur'an revealed on Rasoolullaah (SAWS)? A: The first verse of Qur'an, “Iqra' bisme rabbekal lazi khalaq…” was revealed on Rasoolullaah (SAWS) at ‘Ghaar-e-Hiraa' ( cave of Hiraa ) which is at present called as ‘Jabal un-Noor' ( Mountain of Glory ). Q5: Where was the last verse revealed? A: The last verse of Qur'an, “Al Yauma akmalto lakum deenakum…” was revealed at the time of Ghadeer-e-‘Khumm when Rasoolullaah (SAWS) appointed Maulana Ali (AS) as his Wasi by the orders of Allah . Q6: Which Surah does not have “Bismillaah” in its beginning? A: Surat ut-Taubah or Surat ul-Baraa'at, the 9 th surah of Qur'an does not have “Bismillaah” in its beginning. Q7: In which Surah is the “Bismillaah” repeated? A: “Bismillaah” is repeated in 27 th Surat un-Namal. Q8: What is the eye, heart, soul, brain, and face of the Qur'an? A: Eye of Qur'an – Aayat ul-Kursee; Heart – Surah Yaaseen; Soul – “Bismillaahir Rahmaanir Raheem”; Brain – Surat ur-Rehmaan; Face – Surat ul-Faateha. Q9: What is the soul of Surah Yaaseen? A: “Salaamun qaulam mir rabbir raheem”. Q10: How many Surahs bears the names of the animals in the Qur'an? A: There are five Surahs which bears the name of an animal: Surat ul-Baqarah (Cow), Surat un-Namal (Ant), Surat ul-Feel (Elephant), Surat ul-‘Ankaboot (Spider) and Surat un-Nahl (Honeybee). Q11: How many Surahs bears the names of a Prophets? A: Surah Yoonus, Surah Hood, Surah Yoosuf, Surah Ibraaheem, Surah Luqmaan, Surah Mohammad and Surah Nooh. Q12: How many Surahs has ‘Huroof-e-Moqatta'aat' (broken letters) in their beginning? A: 29 Surahs has broken letters in their beginning. For eg. 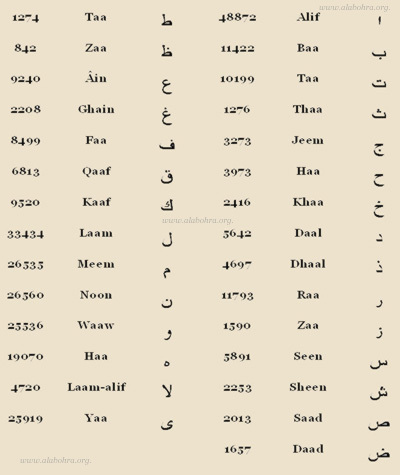 Alif-Laam-Meem, Yaa-Seen, Taa-Haa, Alif-Laam-Raa etc. Q13: In how many years was the Qur'an revealed? A: Qur'an was revealed in 23 years: 13 years in Makkah and 10 years in Madinah. Q14: Name of which prophet has been mentioned the most in the Qur'an? A: Hazrat Moosa (AS) – though there is no separate Surah in the Qur'an of his name. Q15: Which is the longest aayat (verse) in the Qur'an? A: The longest verse in the Qur'an is ‘Aayat ud-Dayn' which is the 282 nd verse in Surat ul-Baqarah. Q16: Which word exactly divides the Qur'an into two parts with respect to the count of its letters? A: The alphabet “taa” of the word “Wal-Yatalattaf” which occurs in the 19 th verse of Surat ul-Kahf, divides the Qur'an into two. Q17: Who is the preacher of the Tanzeel-Zaahir (revealed meaning) and Taaweel-Baatin (hidden meaning) of the Qur'an? A: Rasoolullaah (SAWS) is the preacher of Tanzeel and Hazrat Ali (AS) is the master of Taaweel of the Qur'an. Q18: Who did the “e'raab” (putting of the diacritical marks) of Qur'an for the first time? A: The companion of Maulana Ali (AS) - Abul Aswaa Du'aali. Q19: Which is the last complete Surah to be revealed? Q20: Which Surah starts with the word ‘Tabaara kallazee'? A: Surat ul-Mulk and Surat ul-Furqaan. Q21: Who arranged the order of the verses of Qur'an as per its revelation for the first time? A: Maulana Ali (AS) arranged the Qur'an for the first time in the order of its revelation. Q22: Which Surah is related to Rasoolullaah (SAWS) and Maulana Ali (AS)? A: Surat ul-Muddassir and Surat ul-Muzzammil is related to Rasoolullaah (SAWS) and Surat ul-‘Aadeyaat is related to Maulana Ali (AS). Q23: Names of how many Surahs are without “dot ( nuqtah )”? A: Surat ul-Asr, Surat ut-Toor, Surat ud-Dahr, Surah Taahaa, Surah Saad, Surat ul- Mulk, Surat ur-Room, Surah Hood, and Surat ur-Ra'ad. Q24: Names of how many Surahs is only one letter? A: Three surahs – Qaaf, Saad and Noon . Q25: How is Qur'an related to science? A: There are about 1000 verses in the Qur'an related to science and till now 80% of them are proved by the scientists to be true. Q26: What should you do when you come across a Sajadah (prostration) while reciting the Qur'an? A: You should prostrate in any direction. The one who is listening to the recitation should also prostrate. Q27: Which Hissah or Paarah (sections) of the Qur'an begin with the new Surah? A: 1 st section – Surat ul-Baqarah; 15 th section – Surah Bani Israa'eel; 17 th – Surat ul-Ambeyaa; 18 th – Surat ul-Mumenoon; 26 th – Surat ul-Ahqaaf; 28 th – Surat ul- Mojaadelah; 29 th – Surat ul-Mulk; 30 th – Surat un-Naba'. 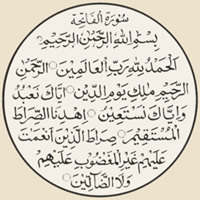 Q28: Which Surahs are called “ Mo'awwezatain ”? A: Surat ul-Falaq and Surat un-Naas. Q29: Which Surah don't have the letter “Faa” in its verses? Q30: The reward of the recitation of which Surah is considered equal to the reward of the recitation of 1/3 Qur'an?  This mark denotes the end of Aayat and you should stop at this point.  It denotes that the stop is absolutely necessary, otherwise the sense of Aayat gets distorted and the meaning changes.  It is recommended to stop at this mark. It denotes an end of a sentence but not the end of an argument, as in the case of paragraph or section.  To stop at this mark is optional. If you do not stop, the sense is not changed.  You should not stop at this mark, but stopping does not harm the meaning.  You should not stop at this mark, instead you should join the following aayat. Stopping at this mark to take breath is permissible.  You should not stop at this mark. It is recommended to join the verses.  It denotes a stoppage but it is recommended not to do so.  You should stop at this mark. Continuing is allowed.  Whether you stop at this mark or not – both are permissible.  It denotes that the meaning is same as that of previous verse.  You should stop briefly at this mark without taking breath.  You can stop at this mark.  This mark is contrary to that of Waqf-e-Laazim. You should not stop here - doing so will change the meaning of the aayat.  You can stop at this mark for long interval.  To embrace; there are three dots on the aayat. One word is such that if it is recited with the preceding or the following verse, it is correct both the ways. Meaning does not change. E.g. ‘zaalekal ketaabo laa rayba feeh hodal lil muttaqeenal lazeena', here there are three dots on the word ‘feehe' in the Qur'an which means that if you recite ‘feehe' with ‘zaalekal ketaabo laa rayba' or with ‘hodal lil muttaqeenal lazeena' – both ways are correct.  This mark denotes the end of a paragraph or a section of Surah. This mark has three figures – the figure above the ‘Ayn denotes the number of rukoo' of that Surah; the figure in the middle denotes the number of verses completed hitherto; and the figure below the ‘Ayn denotes the number of rukoo' of that paarah or section of the Qur'an. You should begin reciting the first division on Friday and then continue to recite each division everyday such that the seventh division is completed on Thursday. In this way the recitation of Qur'an is completed in a week. As soon as you finish reciting seventh division on Thursday, you should recite Surat ul-Faateha which means that once again you have begun reciting the Qur'an. After completing the Qur'an on Thursday, you should recite the du'aa of Khatm ul-Qur'an and keep the Qur'an on the head and then facing the Qiblah you should seek the fulfillment of your wishes.